Lowest decrease during the second half of July since 2007, and second lowest decrease over-all. Remarkable. I'll try and post on the ASIB tomorrow. It seems years with low end-June volume tend to exhibit a lower loss during July, probably because there's less easy ice to melt. 2012 has the third lowest July loss. The little deviation in loss rate below 2012 caused this year to lose the lead, for the first time since many months ago. In my view 2017 seems to continue losing steam little by little, and chances of a new record are decreasing, especially as 2012 had the GAC effects in Aug, and a very late refreeze date in Sept (though the little storm we just had shows the race isn't totally over yet). A 2nd place is highly probable in any case. Isn't this now the "August 1" update? If the gap on July 1 was 180K, and the gap 'shrank' by 180K (Neven's numbers: difference of -5619 and -5439), it looks like 2012 and 2017 are tied. Yes 2012 and 2017 are tied. The differences are smaller than the measurement error based on what I saw at the PIOMAS web site. This is pretty much what I expected based on the cool cloudy weather. If the CAA breaks loose, the loses over the next 6 weeks could be greater than usual, otherwise expect this year to fall behind 2012 in all measures. An alternative view of the current figures is that the ice is 4% thinner on average than in 2012 making it easier to lose extent and area from this point. I still expect to see a good deal of late season export through the CAA and otherwise, and it may not stop flowing as easily as last year. There was some very thick ice that got into the passages and stopped the flow last year; I think that stopped it more than the cold did. The volume numbers were updated, but not the daily gridded data yet. Attached is the anomaly graphic where the 2012 is now lowest for the first time. I highly doubt that this is accurate. All those melt ponds, floes, rain could have tricked the sensors. I only say, that Jetstream activity- & record extreme weather events just don't fit with those "high" Volume numbers. The volume gap with 2012 has gone for now. PIOMAS is an ice volume model - whose numbers are derived from multiple sources of data, not any particular "sensor" - and the far superior one, by any scientific standard. I would strongly recommend you to adjust your personal perceptions so that they fit certifiably accurate data, not the other way around - adjust the accuracy of data so that they fit your predetermined personal perceptions. Besides, there is nothing particularly extreme about this melting season, and this seems perfectly reasonable to assume that volume and extent/area measures would realign again as minimum approaches. It is quite remarkable how the volume trajectory keep tracking 2014, that year also had a remarkably warm winter, heavy snow cover and lots of ice in the Barents. Could this be an indication on melting patterns in case of warm winters and heavy spring snow cover, or is it merely coincidental? True. But at the same time, once should not blindly accept as "truth" any measurement or model output. Scientific (i.e., critical) thinking involves weighing all available evidence. PIOMAS is a single model dealing with a very complex, poorly characterized, difficult to observe, and rapidly changing system. According to its authors it has a fair amount of uncertainty (even before recently accelerated changes to the system). I'm not saying PIOMAS is "wrong", but it pays to keep your eyes open. "A range of observations and approaches, including in situ ice thickness measurements, ICESat retrieved ice thickness, and model sensitivity studies, yields a conservative estimate for October Arctic ice volume uncertainty of 1.35 × 103 km3"
"PIOMAS appears to overestimate thin ice thickness and underestimate thick ice"
The curve appears to shift to the left over the years. If that trend has continued, does it not imply that PIOMAS may now be overestimating ice thickness even more? Anyways, something to keep in mind. Ice is thicker at the start of the melting season. If PIOMAS is overestimating thin ice then we would expect greater PIOMAS declines at the end of the melting season. We see the opposite- there has been a significant decline in the proportion of ice that melts in the 2nd half of the melting season. Hm, from a first skim of the paper (linked in my last post), it seems the thick ice PIOMAS has the most difficulty with is the patch just north of the CAA. So I'm not sure if your reasoning is supported by their data, but I'll have to read the paper more thoroughly. By the way, it seems well written so you may want to read it also. Edit: Also, I think you may have your logic backwards. If PIOMAS is underestimating thickness at the start of the season (when the ice is thicker) and overestimating it at the end (when it is thinner), then it would be underestimating the melt. But like I said, I don't think that's what is going on. Have a look at Fig. 4b for starter (specifically, look at the thicknesses they have plotted, and look at the year to year trend). PIOMAS is an ice volume model - whose numbers are derived from multiple sources of data, not any particular "sensor" - and the far superior one, by any scientific standard. But hardly hard factual data recovered from tens of thousands of data points delivered by tens of thousands of monitoring systems. It is, as you say, a model of these "available" data which are hardly complete. Meaning that PIOMAS has to fill in the blanks. PIOMAS is an excellent tool which is, as you say, the best of the available tools we can use. That being said, it is a Model and is not hard data. In a time of extreme change, where the modelling is behind reality, then it is likely to have significant challenges in terms of correctness. The problem with the Arctic and forecasting is that it is vital that certain areas are absolutely correct in order to try and forecast the impact of any weather events. PIOMAS can supply overall certainty to a high degree, indeed the highest degree currently available, but it cannot tell us, with a high degree of certainty, what is going on in some of those vital areas. This has been seen and proven over and over again and it does not do PIOMAS the credit it deserves by insisting that this is not the state of affairs. Personally I had thought that 2007 and 2012 were outlying years of such spectacular change to make them "Extreme" in every sense of the word. 2017 extent, today, sits < 50kkm^2 above 2007 and below all other years. At a time when 2017 is showing massive potential for ice destruction from the most moderate storms, smack in the middle of the post 2012 "storm season". In the next 5 days, 2012 parted company with 2007 and headed for a new record. 2017 is showing signs that it could go either way, 2012 or 2007. But it has firmly crashed through 2011 with no sign of slowing. If anything, the opposite. It is so comforting to know that 2007 and 2012 are now considered so unexceptional that a year which is tracking them could be considered "normal". Whilst there is still opportunity for 2017 to stall and fail to make a new record or, even, to finish between 2007 and 2012, there is also ample opportunity for 2017 to crash through 2012 and head for the record books. The most extreme thing about 2017 was the winter/spring warmth. All things being equal, that extreme weather is unlikely to have no impact on the summer low. Given the summer melting season we have had, 2017 should already be heading for a 2010/2011 track. The fact that it is not should be warning enough of the potential to come. Whilst none of us are experts in this field and all of us welcome being corrected in our assumptions, it is best if the correction is entirely accurate and not the aspiration of the person who is correcting. A lot of talk dissing the Danes. Seems like many can't STAND data that runs against the narrative of catastrophic sea ice collapse. Sorry, just reads quite biased as I go down the lurker posts. Just how accurate is PIOMAS? And does PIOMAS measure in 3D..volume? Is it possible that some are more inclined to accept PIOMAS because it shows a higher melt? There are also times when PIOMAS shows lower melt, but people who have been around enough are still inclined to accept it. I learned that in 2013. Read the ASIB if you want to know more about PIOMAS since 2010. PIOMAS has proven itself over the years. Several papers have been published explaining its results. It assimilates all kinds of measurements from submarines, operations like IceBridge and satellite measurements. DMI simply looks off (as does JAXA). But to see it you have to follow things closely. And as far as I know there aren't any papers or texts, explaining how the model works and how it stacks up against observational data. If you want a model that shows higher melt, ACNFS (also known as Hycom) would be more suitable. Last but not least, scientists at the Polar Science Center are very open to contact with citizen scientists like Wipneus, Chris Reynolds, myself and others. Every month they make an effort to make data available as fast as possible. Do you see now why PIOMAS is popular and has a good reputation? As was obvious for months, PIOMAS SIV has indeed been trending back toward a mean, so it's really no surprise at all that 2017 finally ceded first place to 2012 after a remarkable string of days and months in the lead. Monthly average PIOMAS volume has been in the lead for the past nine consecutive months going back to November; there's no other stretch like that in the record over the past 30 years. A new daily volume record isn't likely this year, but second place is practically a lock at this point; volume decrease would have to shallow out tremendously to stay above current second-place 2011. In fact, a repeat of every other year on the record except for 2013 would result in a solid second place finish. Meanwhile, a repeat of 2016 would result in a new record. Stop with the generalities and straw man arguments, please. "A lot of talk...". "Seems like many can't stand...". "Just reads quite biased...". "Some are more inclined...". If you've got something to say about PIOMAS, say it. Don't come in here and cast blanket aspersions on the motives of others. Stick with the science, and address specifics if and when you come across them. I'm expecting another warm Winter -- WACC. Probably be more interesting, and harder to understand, if we didn't have one. 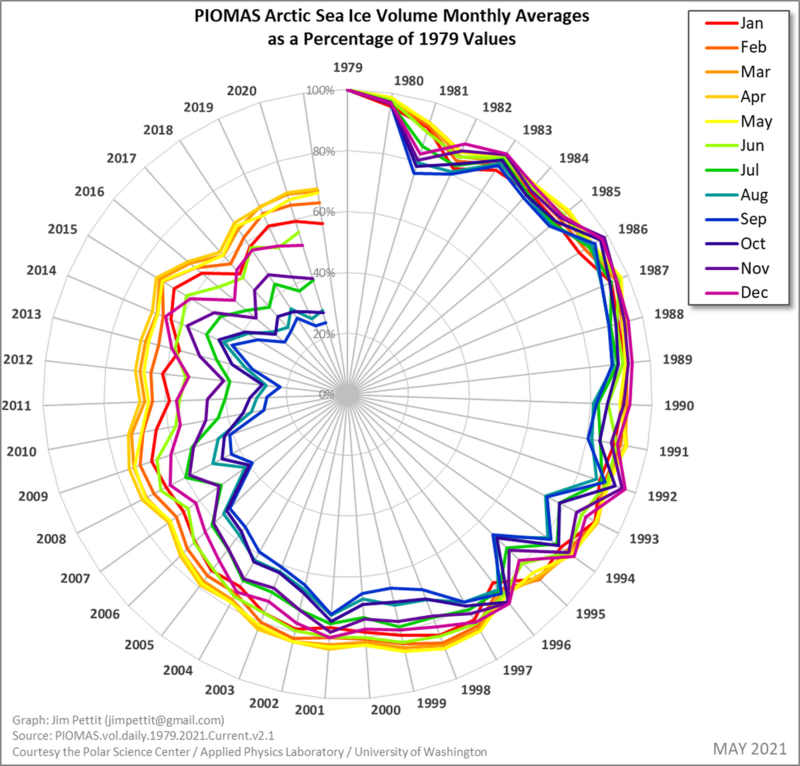 PIOMAS indicates a slowing of volume loss such that 2012 has now taken a small lead while simultaneously supporting a trend towards a catastrophic sea ice collapse. My point is; when you have a well-documented model, like PIOMAS, you should start by assuming that this model is indeed functioning properly and produces a reliable output, and that in doing so you do not submit blindly and willfully to said model (People should not have to explain that last point every single time they make the case that the PIOMAS output is reliable). Of course, you can challenge this model, but to do so you need some kind of hypothesis, and preferably, an objective reason to challenge the model in the first place. Let’s for the sake of argument make the, in my subjective opinion, dubious assumption that this melting season is something special and different (the 2017 melting season as modeled by PIOMAS, not the 16/17 refreeze, not the melting season that has yet to come), it’s a situation that will arise sooner or later anyway. First question is; are there any factual reasons to assume such conditions will impact the accuracy of the model? Any documentation that the model performance declines with increased melt ponding, more rain, wave action etc? greatdying2 provides one such factual reason in his reply to me, while the comment I originally responded to provided none whatsoever. Now, you might argue such documentation does not exist because of the unprecedented nature of the present situation or because no one is funding arctic research these day. Whatever it might be, let’s again - for the sake of argument - assume such claims are valid. Still, there needs to be an objective reason for calling into question the reliability of the entire model, and if the only thing you have are the model output, then use this to make your argument. Is the data behaving in an erratic or arbitrary manner? Is the modeled data directly conflicting with other available data (such as satellite imagery)? Demonstrate it, show us, explain. Use the simplest of linear regression models, or whatever, present it and see if your hypothesis can withstand some scrutiny. Because I can’t see what is so wrong with the latest batch of PIOMAS data. This is “just” a forum, most people who come here are just casual observers – like myself – and I’m not saying you need to spend hours, day, or years formulating and testing scientific hypothesis’ to be allowed to post here. But if you are going to make grandiose claims, challenging the fundamental reliability of rigorously tested models, then you should damn well be held to the same standards as the people you are challenging – in this instance the Polar Science Center. I might be horribly wrong here, but I thought PIOMAS had been updated to address this specific issue. Can anyone confirm or refute that? I didn't say anything about whether PIOMAS is underestimating the total melt. I'm pretty confident my logic is correct. If PIOMAS is overestimating thin ice thickness then that means that PIOMAS should show relatively higher melt rates since the ice is actually thinner than PIOMAS thinks it is and will thus melt faster. If PIOMAS is underestimating thick ice then the ice should melt at relatively slower rates since the true ice is thicker. We know that ice is thicker at the beginning of the melt season and thinner at the end. So if this error exists, then you would expect a lot of melt late and not much melt early. The opposite happens. PIOMAS in recent years has shown a lot of melt early and significantly less melt late. Of course this doesn't definitively disprove that assertion about PIOMAS' bias. But that the data appears to contradict it should make you skeptical about it. In figure 4b, the closer the dots are to the bisecting line then the more accurate PIOMAS is. The dots from 2006 onwards are much closer to the line than previous samples. So according to their own graph, the tendency for PIOMAS to overestimate thin ice and/or underestimate thick ice has virtually disappeared since 2006. The PIOMAS results for the last month make sense to me and apparently to a number of other long time watchers of Arctic sea ice. Rather than accept the results of a model blindly because good scientists have done their job well, I always look at model results with the question, "Does this make sense". The PIOMAS model this year fits what we learned in 2013 and 2014 from years with cool, stormy weather and positive Arctic Oscillation values. The results fit what we know about the effects of snow on albedo. This year's summer melt season was set in motion by the heavy snow in the Arctic that began last September in Siberia and by the intense storminess, combined with strong blocking highs in the Greenland sea. What we are seeing in the Arctic is part of a weather pattern of intense storminess around the Greenland sea that has global teleconnections. Low pressure in the far north Atlantic tends to bring low pressure to the Arctic. The very heavy snowfall in Greenland in 2016-2017 is associated with a reintensified thermohaline circulation. So is the positive Arctic oscillation that has kept this summer's weather on the cool side. So the PIOMAS results make sense, but they are not reassuring because the positive AO will help bring warm Atlantic water into the Arctic ocean. Over the intermediate term of the next 5 years this means there will be more ocean heat in the Arctic which will tend to increase the rate of ice melt from below when storms and coastal winds cause upwelling. If PIOMAS is overestimating thin ice thickness then that means that PIOMAS should show relatively higher melt rates since the ice is actually thinner than PIOMAS thinks it is and will thus melt faster. Does thin ice melt faster? I don't want to dwell on this too much since each year has very few data points, not enough I would guess to draw significant conclusions about differences between years. However, while the graph does suggest that PIOMAS may have performed better in 2008-2010 than most earlier years, I was pointing at the year-to-year trend. It is now 2017. If there is a real trend and if it has not been corrected (as Rubikscube suggests), then by now PIOMAS might for example be modelling 2 m ice as 3 m ice and 1 m ice as 2 m ice. I am not saying it is, only that I don't understand very well the limitations of the model. Rather than accept the results of a model blindly because good scientists have done their job well, I always look at model results with the question, "Does this make sense". Personally I am waiting to see the mapped data before I draw any conclusions about whether or not it makes sense to me. OutofWater, the paper by Florian Sévellec et al (July 2017), suggest a reduction of Arctic sea ice weakening the North Atlantic Ocean's current, whereas you state that the North Atlantic Ocean current has been strong and behind reduced melting of Arctic sea ice: PIOMAS volume (July 2017). May be you, or somebody, can clarify and extrapolate from the two points made. The ongoing decline of Arctic sea ice exposes the ocean to anomalous surface heat and freshwater fluxes, resulting in positive buoyancy anomalies that can affect ocean circulation. In this study, we use an optimal flux perturbation framework and comprehensive climate model simulations to estimate the sensitivity of the Atlantic Meridional Overturning Circulation (AMOC) to such buoyancy forcing over the Arctic and globally, and more generally to sea-ice decline. It is found that on decadal timescales, flux anomalies over the subpolar North Atlantic have the largest impact on the AMOC, while on multi-decadal timescales (longer than 20 years), flux anomalies in the Arctic become more important. These positive buoyancy anomalies spread to the North Atlantic, weakening the AMOC and its poleward heat transport. Therefore, the Arctic sea-ice decline may explain the suggested slow-down of the AMOC and the ‘Warming Hole’ persisting in the subpolar North Atlantic. DMI simply looks off (as does JAXA). But to see it you have to follow things closely. Agreed. That's why "Steve Goddard" chooses their thickness maps above all others! And as far as I know there aren't any papers or texts, explaining how the model works and how it stacks up against observational data. If you want a model that shows higher melt, ACNFS (also known as Hycom) would be more suitable. It seems that this message bears repeating? A CICE modeller once told me that "the CICE model is much more sensitive to forcing data than to internal model parameters". Perhaps that's got something to do with the apparently wildly different results? To be frank I find it hard to believe any of them, given the differing outputs. That paper does have some detail about how the DMI model works and how it stacks up against observation. Americans use an american weather forecast for forcing, europeans a european forecast, there's no reason to suspect significant biasses in model results from that choice. All the HYCOM-CICE models assimilate sea surface temperature and sea ice concentration. DMI uses a relatively crude and insensitive method compared to ACNFS, presumably because they get the same sort of instability problems ACNFS struggles with from time to time if they try to make their model more sensitive to the data. DMI also assimilates climatology for surface salinity, which is something a model that wants to follow changes in climate really shouldn't be doing. Again I assume they are doing this to prevent model instability. Verification against their own data is not impressive. Seasonal ice at the tip of Greenland melts out 1-3 months too early and the summer sea surface temperature is biassed high. This is consistent with the "funny look" DMI volume has for its seasonal cycle, it melts too aggressively when its melting and stops melting too soon. DMI also have their own radiation code which was optimised for a Nares Strait model, and I suspect this may play a part in why they seem to be putting too much energy into the ice in the early part of the season and not enough at the end of the season. The CICE sensitivity is relevant to its purpose as a sub-model in GCMs, but not here. Any model thats trying to follow the seasonal cycle or forecast the ice state a week in advance has to have this level of sensitivity. If you want to know what the extent of the ice will be where you intend to sail next week, use one of the US HYCOM-CICE products, unless you suspect the US of disseminating disinformation, in which case use DMI for a second opinion. If you want to know what the volume of the ice was last month, use PIOMAS. It probably is possible to implement CICE in a manner that would give a better volume product than PIOMAS, but no one has tried to do it yet. It probably is possible to implement CICE in a manner that would give a better volume product than PIOMAS, but no one has tried to do it yet. Thank you for all the information in your post -- it is exceptionally useful. This last tidbit is intriguing. I don't suppose you would care to elaborate? I was at one point discussing this with Peter Wadhams to reverse engineer US NAVY charts by converting sea ice thickness pixels to volume and adding them up to receive volume to compare year-to-year. The reason was that US NAVY charts showed sea ice volume falling whereas Cryosat people said it was increasing. I would have printed a poster, then divided it like a puzzle into boxes of colour codes and then tallied them all up to prove that NAVY lost ice, Cryosat gained ice. I felt like it was a conspiracy. Because of a lot of manual working, other priorities took over that. Yes, and thank you. Much clearer now. And apologies to Jim for the straw-figures and editorial comments. There's a huge difference between twenty plus year effects of Arctic warming plus sea ice melting discussed in that paper and the effects of changes in the Arctic oscillation over several years. Moreover there's been a change in the PDO aka IPO - the multidecadal oscillation in the Pacific. The change in the oscillation in the Pacific changes the location of the high pressure area in the south Atlantic and increases wind forcing that drives warm water north. The combination of the positive AO and PDO has intensified the flow of Atlantic water into the Arctic and the intense snowfall last winter in Greenland is strong evidence that the meridional overturning circulation has intensified. There is also oceanographic evidence and satellite based sea surface height evidence that the overturning circulation has reintensified. Warning to folks who aren't that familiar with the MOC. There are a number of different measures of it and there are time lags between the different measures. There apparently was a major slowdown in the MOC that began in the late '90s following the period of strongly positive AO winters from the late '80s to the 1995. The MOC was particularly sluggish in 2010 when the Gulf Stream slowed down and the tropical Atlantic was ridiculously hot. So put my claim recent of MOC reintensification in the context of a larger long period slow down which is consistent with that and other papers. All the HYCOM-CICE models assimilate sea surface temperature and sea ice concentration. Are you quite sure about that? I'll go away and check my notes, but I'd swear that when I explicitly asked that question I was reliably informed that ACNFS did not assimilate concentration across the pack, but merely the ice edge. HYCOM-CICE models pretty much have to assimilate ice concentration data and sea surface temperature in some form or another, because those are the only variables they pass between the ocean (HYCOM) and ice (CICE) models which have data available to be assimilated. Agreed. I've said it before, I'll say it again. All methods are within a margin of error anyway, and no method has a margin of error into which the others do not overlap widely. Only peer-reviewed analysis, replicated time and time again, could sort out which is the best, which won't happen in decades. It's a good discussion though, but in the end, you can only compare apples to apples, and realize that it has a margin of error. All methods are very fuzzy-edged. Are we talking about thickness, volume, or extent? I lost track int he mass of posts on this. Yes. We are talking about PIOMAS, and why its a superior measurer of volume to DMI. That requires consideration of extent/area as well as volume. <snip> I have forwarded your reply to AMEG. (I do not want government decision-makers to get mixed up with different time periods and draw wrong conclusions from mixing 20+ and <7 year and current season conditions.) Many thanks! But if you are going to make grandiose claims, challenging the fundamental reliability of rigorously tested models, then you should damn well be held to the same standards as the people you are challenging – in this instance the Polar Science Center. I don't disagree in substance. What I would say is if you're going to pull someone up about it, then do at least make the case a bit more strongly. PIMOAS is a model based on data and not verified data in and of itself. All volume models have been criticised on these boards because the enthusiast effort we see on a daily basis can, at times, make a complete nonsense of the volume models when there is patently no ice where the model says there is 2M ice or more. Even worse when a storm kicks up and the area showing 2M ice, in whatever concentration, suddenly vanishes in a day or two and the whole area is clear of ice. These are statistical anomalies and they do exist in all the models. Even more so in challenging times of rapid and fundamentally outside current understanding, rates of change in ice dynamics. It is correct to challenge. That is how science gets better. But it is also a requirement to provide the evidence of where the model is failing, so that those who work with the models can work out why it failed. As you say most of us do this as a hobby and very few subject their comments to rigorous statistical analysis. Most don't have the time and the rest of us wouldn't know how to anyway. But it doesn't meant that the analysts among us can't spot inconsistencies. I guess I'm saying educate don't berate. Wipneus, has there been no gridded data for August yet? I am thinking of writing Dr. Zhang again. PIOMAS update has been posted on the ASIB. Only the monthly data which I do no use anymore. The PIOMAS people are actual humans, taking vacations and joining scientific meetings, so I am not all that worried or surprised about an occasional delay. Ok, thanks, I will wait patiently.